Color(s): A varying mixture of cream, red, black, and gray. 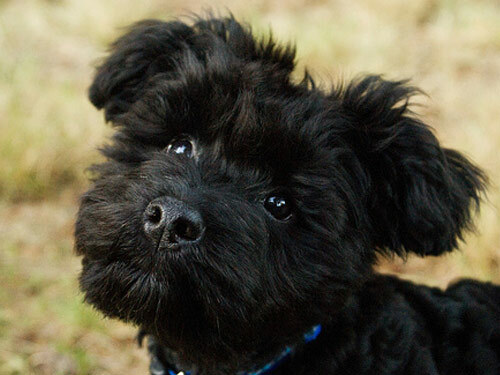 The Cairnoodle, also known as the Cairn-Poo, is created by the crossing of two breeds: Cairn Terrier and Poodle. They are commonly referred to as "designer dogs", and are not as popular as many of the other crosses. The ideal Cairnoodle is muscular, sturdy, and compact. They exhibit a hardy appearance, broad head, and large, dark eyes. Cairnoodle's are agile and high-spirited. Friendly, affectionate, and loyal, the Cairnoodle may possess the boldness of a Terrier, the sensitivity of a Poodle, or both. They require an inordinate amount of attention and do not do well if ignored or left alone for extended periods of time. They will become destructive if bored or lonely. They do well with children, dogs, and non-canine pets they have been raised with. The Cairnoodle is alert, suspicious of strangers, and will bark to announce visitors or out of the ordinary sounds. The coat of the Cairnoodle must be brushed several times a week to prevent matting and tangling. Bathing should be done on a regular basis using a mild shampoo. Dental hygiene is important to prevent early tooth loss. They are prone to such health issues as PRA, luxating patella, heart problems, portal shunt, and CMO. The coat of the Cairnoodle may be very curly or slightly wavy. It is typically wispy and short all over the body. The coat is longer and more profuse on the face. The Cairnoodle typically exhibits independence but is willing to please. They may be difficult to housetrain. The crate training method works best. The Cairnoodle is adept at learning tricks. They will not respond to harsh or heavy-handed methods. Training must be done with firmness, fairness, patience, reward, and consistency. The Cairnoodle is suited for city and apartment living provided they are sufficiently exercised and mentally stimulated. They must have a variety of safe toys to keep them occupied indoors. Cairnoodle's thrive on family interaction, off-lead play time in a securely fenced yard, performing tricks, and securely leashed walks.